Every Saturday morning 10am to 12pm on Hythe Canal . Kayak sessions are for anyone aged 8+ from April - October and from 13+ over the Winter season, November - March (personal wet-suits will be required). April to September sessions also held every Thursday 6-8pm for paddlers aged 11+ who have achieved the “Start” award or Paddlepower Passport. Our qualified coaches provide 2 hours of instruction in kayaks, sessions are designed to help you achieve your British Canoeing awards. 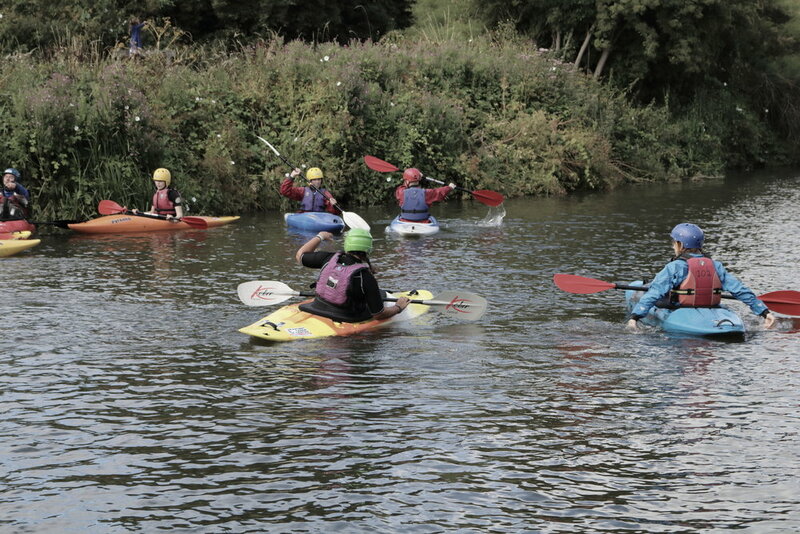 If you are under-18, we help you achieve the equivalent awards on the Paddlepower scheme. We split up into groups determined by age and ability. There is often an emphasis on games for the youngest learners and technical skill for those that are serious about paddle-sport. Arrive 15 minutes before the session begins to get kitted out (kayak, helmet and buoyancy aid are provided), we aim to be on the water by 10am. Our centre is located in between the sea and the canal. It’s heavenly! The calm canal is ideal for our mixed ability weekly sessions. For the more adventurous, sea and river trips take place during the year. We often run holiday or 'have a go' sessions during school holidays. Our prices for adults for these sessions are significantly cheaper, well worth following us on Facebook to hear about our latest offers. In the Summer and Autumn we host bell-boat tournaments, these are private events but if you’re an organisation searching for a new team challenge, contact us to find out more. Want to arrange something else? We are available to organise tailor-made instructor-led sessions for schools, birthday parties, scouts, guides, youth groups or families for private sessions. If you are a group looking for a fun activity, we can arrange it. We also offer one to one training for all levels : beginners; paddlers returning to kayaking; accomplished paddlers wanting to learn a new skill. Canoes and SUPs (Stand-up paddleboards) can be hired from the centre if you prefer to go it alone. Many of our coaches learned their trade at Seapoint. We start by coaching you towards your 1 and 2 star awards on the canal, then we can progress to a 3 Star award on the sea. Beyond that we help you earn your Level 1 and level 2 coaching awards. Become a Seapoint member and enjoy cheaper regular sessions and exclusive discounts for trips and events. Also grants you license to paddle alone between Seapoint and the West Hythe Dam. Join our Facebook group to stay connected with other paddle-sport enthusiasts. Share photos, plan trips and stay updated with all that is happening locally.